A slice through a handrail perpendicular to it will create a section of the rail. This is the defining feature of the rail that determines whether it will be comfortable or not. 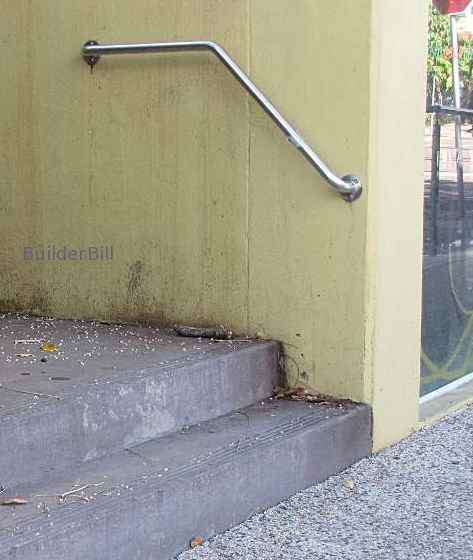 The handrails that fix to the walls at the side of a stair. Handrails are the rails that one holds with the hand. They should have one paramount feature! That is to be easily and comfortably grasped. They are there to provide safety and support, particularly at the beginning and end of a stair and also where a stair changes direction. If someone needs help or assistance negotiating a stair they should be there, at a convenient height and be graspable. Many older stairs have rails that are too wide. The old and ornate handrails are going out of fashion now because of the push from regulators to improve stair safety with things like continuous handrails floor to floor with no breaks. 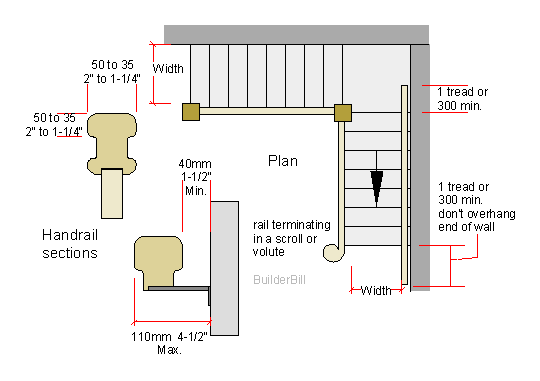 Wall Rails are sometimes called grab rails are rails fixed to a side wall. Most regulations do not insist on wall rails for domestic buildings. When they are used they are usually straight lengths and only rarely do they curve around corners. With commercial building is is a different matter and wall rails are usually required. In the photo it may not be strictly necessary to have a rail in this location but it is here because one and two rise steps are known as the cause of most stair accidents and as this is in a public place the architect has included the wall rail. Note that in compliance with modern stair regulations the rail continues along the wall past the end of the steps. If the wall continued at the bottom it would also continue. This is a safety factor and also to give indication to the visually impaired.